Proven ability with a vast network of international corporate relationships. And effective local capabilities come together at OXUS. Exceptional capabilities in several international markets. Proven capacity to provide support “anytime, anywhere” despite the risk. Unfettered access to key leaders and decision makers at the national, provincial, and district level of Afghanistan, within government and communities. We offer effective consulting, management, business development, and technical solutions for the Capacity-Building, Training, Information Technology, Infrastructure Development and Governing Sectors to both the Government and the Private Sector. Partnerships with top global firms, balanced by our uniquely-qualified and exceptional capabilities in the international market, enables OXUS Group to execute high-impact, multi-component projects through effective quality controls. We deliver reliable results, based upon our client’s goals. 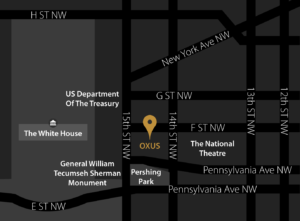 Operating from our Washington D.C. home office, as well as our presence in Kabul, Rome, and Dubai, OXUS Group provides on-time, on-target, and on-budget solutions.